Microsoft recently announced a new feature that lets you create and maintain multiple phony Hotmail addresses from your main Hotmail account. 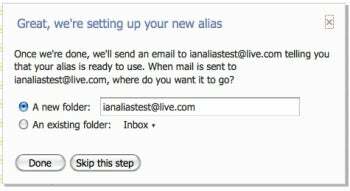 The new alias service lets you create up to five different e-mail addresses per year that point directly to your primary Hotmail account. Microsoft says you can keep up to 15 aliases on one account even though you can only create five aliases per year. Hotmail aliases make it a breeze to hand out a genuine e-mail address in awkward or short-term situations while keeping your primary address private. The average person maintains three different e-mail accounts, according to Microsoft. There are various reasons you might want more than one e-mail address such as dedicating separate accounts to handle junk mail from retailers, business, and personal mail; or maybe an account for comment trolling on the weekends. But checking multiple inboxes every day can often be a pain, especially if you're busy trolling. One option before now was to have all your mail forwarded from multiple addresses to your primary account. Gmail and Hotmail also offer a service that lets you prepend your e-mail address with a '+' symbol such as spam+myemail@gmail.com. But the prepend method requires you to reveal your actual e-mail address within the phony account; Hotmail's new alias feature avoids this. To create an alias click on the cog icon next to your Inbox link in the left pane of the main Hotmail Window. You should see an a pop-up menu with an option to "Create a Hotmail alias." This will take you to a screen where you can create an @hotmail.com or @live.com e-mail address. If you choose an e-mail address that's already taken, you'll be prompted to try again. It should take just a few minutes for Hotmail to create and prepare your new phony address. Once it's ready you'll receive an alert in your inbox. After your alias has been approved, you can decide to have all e-mail that is sent to the phony address delivered to a dedicated folder or to your main inbox. To send mail from your new address just click on your e-mail address at the top of the compose window and select from the drop down menu. Hotmail started rolling out aliases earlier this week, so if you don't have the alias feature in your account yet you should see it soon.